The Bioenergy Corridor is a research and education partnership of people who are innovatively interested in opportunities to utilise the productivity of woody species for fuels of sustainable development, the social issues derived from the intensive utilization of natural resources, and the necessary educational efforts that this challenge carries. The contributors are also actively involved in EduSilva, an organisation working for the promotion, exchange, generation and dissemination of knowledge and research in the areas of forests, nature and the environment. to study bioenergy solutions which are ecologically sound, culturally respectable, economically profitable and socially fair. The global village where biomass as a source of primary energy is harvested and converted for various forms of consumable energy using relevant, advanced and sustainable technologies. 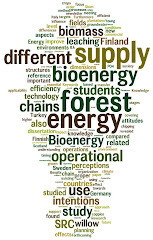 The main research focus aims at exploring the different inter-relations between bioenergy uses, forest governance and forest education, thus combining natural and social sciences approaches.